Anyone can act as a reporter in their community now. While I wouldn’t say that a degree isn’t worth getting, it’s not required. All you really need is an audience — which the internet readily provides to each and every one of us — and the tools to collect the news. The first, and most important, tool a reporter needs is their ethics. Ethics are really the only thing that separates a reporter from anyone else with a smartphone and a Facebook page. There is no reporter’s license, few reporters get any special access to meetings, sources are based on personal trust, and online publishing is accessible to anyone. Journalism ethics are best and most commonly informed by the code of ethics presented most succinctly by the Society of Professional Journalists (SPJ) and more thoroughly by the Associated Press (AP) Stylebook’s statement of news values and principles. The four main points of the SPJ code are to seek truth, minimize harm, act independently and be accountable. Seeking truth may seem obvious but there are finer points that are sometimes lost, even among the professionals. Sometimes mistakes are made as reporters rush to publish a breaking story before their competitors. Sometimes they use the work of others without verifying it or properly attributing to them. Sometimes a story gets oversimplified because of space constraints or when being promoted, which is unavoidable to a certain extent but should always be minimized. Everyone makes the occasional mistake. The important thing for reporters is to do their best to avoid it, recognize when they’ve made one, and do their best to correct it. Sometimes the best lessons are learned by first making an error. Reputable newspapers will issue corrections to factual errors in their story. They follow up with all subjects of stories to present their viewpoints. They tell stories about diverse members of the community. They consider their sources motives and communicate potential motivating factors to their readers. They verify critical information with multiple and official sources. These things aren’t always easy, and quite often take more time than the actual writing of a story, but it is also a large part of what makes reading a reporter’s work worth the time, and paying for a newspaper worth the money. Minimizing harm is often a judgement call that reporters and editors need to make while talking with sources and writing a report. Avoiding undue intrusiveness, taking consideration for who your reporting might effect, and realizing the difference between legal ability and ethical responsibility are things that need to be taken into account. An example that is all too relevant today is in criminal proceedings. A reporter needs to consider the long-term implications to identifying a suspect before they face legal charges, or before they are convicted. If they do choose to identify a suspect early, it is an absolute necessity to follow-up and conclude the story with the conviction or acquittal. If they don’t do the follow up, the subject of the story could have lifelong impacts, even if they’re found innocent. Court records and proceedings are public, but just because a reporter can legally publish someone’s name, doesn’t always mean they should. Acting independently means avoiding conflicts of interest in your reporting. Ethical reporters don’t accept bribes or gifts, pay for access to sources or informants, nor give favorable treatment to advertisers or other supporters. If a conflict of interest in unavoidable, it must be disclosed openly to the reader. Being accountable is something that we hope anyone — reporter or not — would do, but is often overlooked. Acknowledging mistakes, responding to readers, and explaining ethical choices are all important parts of a journalist’s job. Perhaps the most important is being willing to put your name on a story and stake your reputation on it. 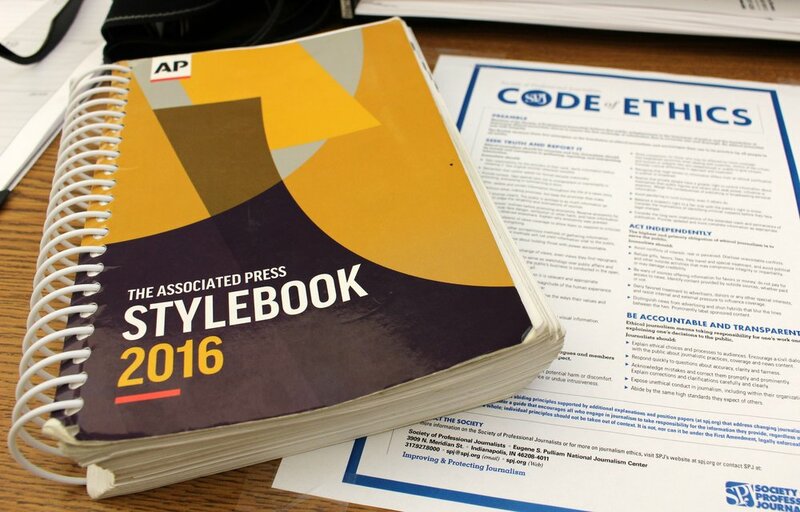 The AP Style Guide provides more specific instruction for more specific situations. When to grant anonymity to a source, how to issue a correction, who to give a byline to, how to provide attributions, and how to disclose conflicts of interest are all covered in detail. Many people don’t understand the conditions of anonymity when granted to a source, but the AP Guide dedicates almost two entire pages to describing the conditions and provisions for anonymous sources. Anonymous sources have factual information that is unavailable through other, non-anonymous sources. The reporter must know their identity and consider them reliable. Anonymous sources are usually lent some credibility by identifying the position that they are in to have the information that they provide. Good reporters will do anything they can to avoid using anonymous sources. They will search for alternate sources for the information and try to convince the source of the importance of being identified. Anyone can be a reporter in their community nowadays, but responsible reporting requires learning about ethics and discipline exercised by professionals. Doing so builds trust with your audience, and your sources.